The ‘Kestos’ style bra was one of the defining moments of 1930s lingerie, marking the move from the 1920s trend for a flattened bust to the more lifted ‘natural’ silhouette of the 1930s. 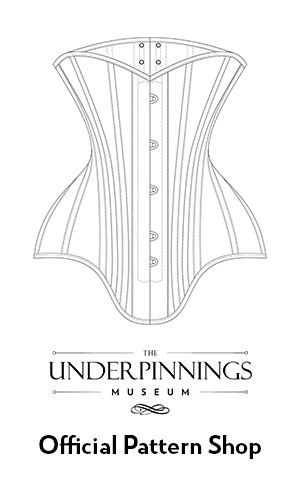 It was one of the first commercially produced bras available on the market. This advert is part of a series released by the Kestos brand that lauds their designs’ suitability as activewear (in this instance, to be worn during dancing). These adverts highlight the need for ‘suitable support’ and describe the brassiere as ‘essential’, whether for movement or compatibility with outer clothing. The slender women featured in the illustrations of many 1930s adverts for the Kestos Brassiere are elegant yet toned, capturing a dual obsession with Hollywood glamour and with fitness. 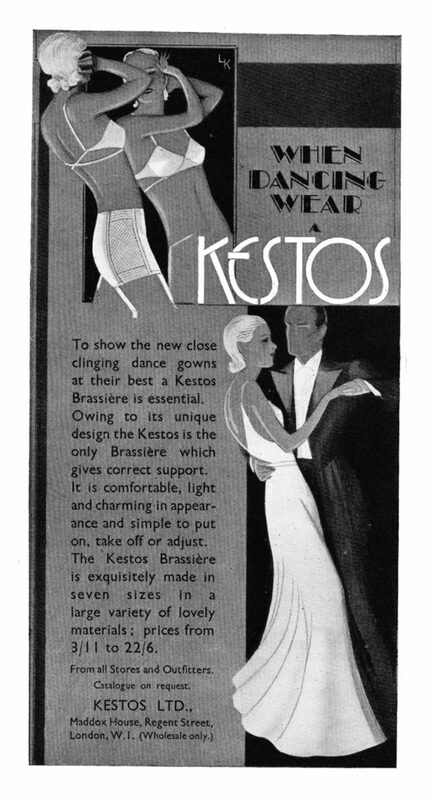 One 1937 UK magazine advert features evocative description of the Kestos woman, describing her as appreciating the ‘exquisiteness of form’ of the Kestos, and the following paragraph states that ‘a simple adjustment of the straps and the everyday Kestos becomes a backless brassiere for evening or sports wear.’ Although the advert is clearly selling the lifestyle of this idealised Kestos woman, the reader’s attention is also drawn to the simple yet effective structure of the garment, and its uniquely adjustable straps. The Kestos bra is based on two lightly darted triangle cups, overlapping at the centre front. Elasticated straps cross at the centre back, fastening around the front with buttons underneath the bust point. The bra was designed by Rosalind Klin and first trademarked in 1925.